This is the place where you can recover your health, breathe fresh, microclimatic air and relax on comfortable deckchair, surrounded by relaxing music. Salt Cave is the only place in Poznań built with natural blocks of sea salt from Dead Sea and Kłodawa salt mine. Fairy-tale inside of the Cave and microclimatic conditions acts in a soothing and healing way. It will relax not only your body, but your mind as well. The feeling of peace and deep relax will last long time after your visit.Inhalation in the Cave is a come back to natural curing methods. Microclimat present in the Cave improves significantly your helath condition and helps in treatment of many diseases, not only these of respiratory, but also digestive, cardiovascular and nervous systems and solves some dermatological problem.Living big city life and pursuiting modernity and progress, we forgot about significant properties of salt. It is valuable cure in a treatment of many illnesses. It consists of many important elements, which have great effect on our body. Air saturation with microelements, such as: iodine, sodium, calcium, magnesium, potassium, bromine, iron, selenium, manganese, zinc and copper causes you to get whiff of sea breeze in Poznań!Salt cures and soothes many ailments and gives a man mental and physical comfort every day. 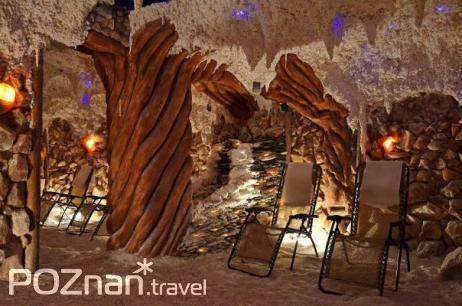 Natural activity of the Salt Cave is enriched with considerable values of music and light therapy. That creates specific ambience with broad therapeutic values.